Dreaming with a Beach Wedding at Rock Bottom Price? Enjoy of a wonderful Beach Wedding with all the trimmings (including Reception), at a fraction of the regular price by having it in the Winter months! Stop dreaming and come to us for your very own Beach Wedding in Paradise at a super great price. Have your wedding with us in Gulf Shores / Orange Beach, Alabama where mild temperatures greet visitors year-round. Coastal Alabama has hot Summers and mild Winters. Orange Beach & Gulf Shores have some of the best Sunsets of the year captured on camera during the Winter months. One of them can be the background for you very own Beach Wedding in paradise. 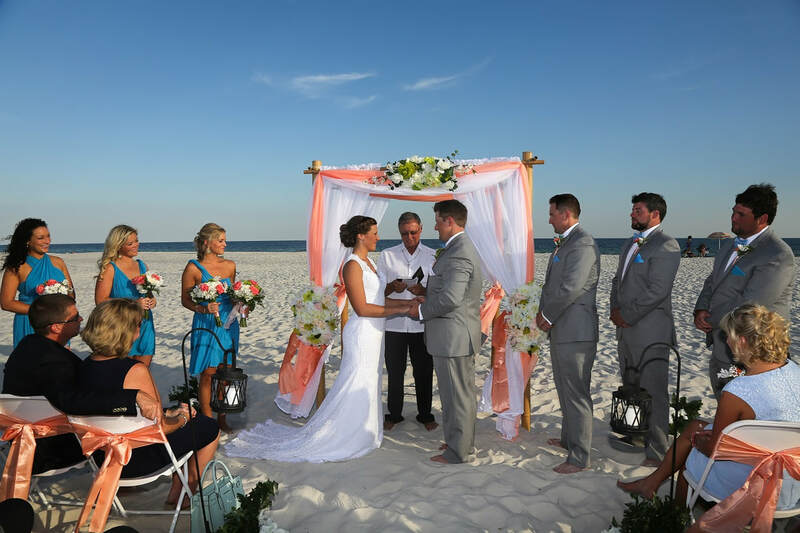 Beach Weddings Alabama can offer you Beach Wedding Ceremony only packages OR All Inclusive Wedding with Ceremony & Reception packages for truly rock bottom prices during the Winter months. Check our Winter Packages below and reserve your date TODAY! AVAILABLE DATES ARE SELLING OUT FAST! Orange Beach Weddings, Gulf Shores Weddings, Beach Weddings Alabama, Beach Weddings in Alabama. We perform weddings 365 days a year.